Researchers at Oxford University say that tennis keeps you young, fit and healthy. And it represents a better alternative to jogging. 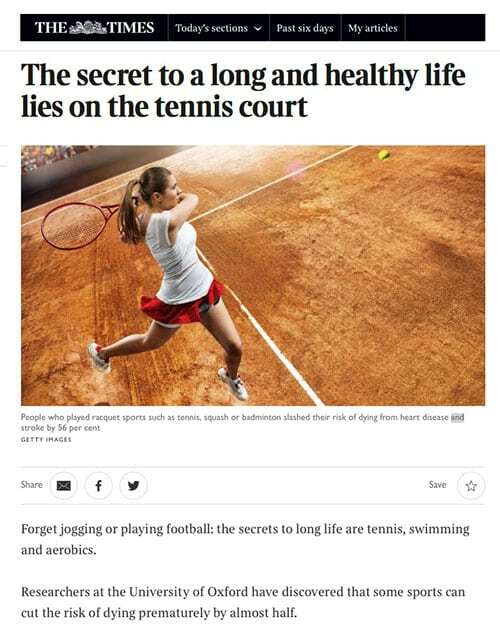 Commenting online on the article in The Times on November 30 (left), En Tout Cas owner Rory Shepherd points out the benefits of synthetic grass surfaces over tarmacadam which can be unforgiving on joints of all ages. Proof that tennis really is a game for all ages can be seen in the video above which shows 95-year-old Basil Smith playing a very respectable game - and an astonishing level of fitness for his age. En Tout Cas have been building and caring for all year round tennis courts since 1909, and is the best-known name for tennis court construction. © 2018 EnToutCas. All Rights Reserved.